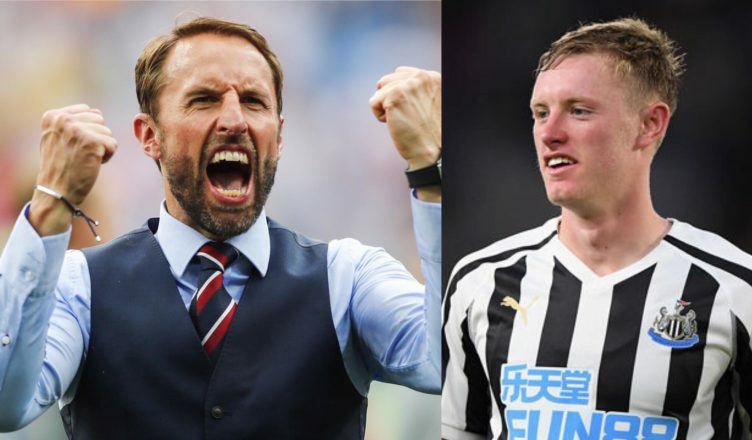 Journalist reveals Gareth Southgate’s exciting plan for Sean Longstaff – Incredible news if true – NUFC blog – Newcastle United blog – NUFC Fixtures, News and Forum. According to the Northern Echo, Gareth Southgate could now ‘fast-track’ Sean Longstaff’s progress in the England national set-up after being left so impressed by the midfielder’s recent performances. The report reveals that Longstaff looks set to be called up by England’s U-21’s next month, rating him as a ‘strong contender’ to earn a place in Aidy Boothroyd’s squad ahead of this summer’s European Under-21 Championships – but Southgate has already shown that he isn’t afraid to throw talented youngsters in at senior level. It’s also claimed that a member of Southgate’s backroom team was present at Monday night’s draw at Wolves, being instructed to gather a ‘detailed dossier’ on the 21-year-old’s performances. SEAN LONGSTAFF is set to be fast-tracked into England’s national set-up after bursting onto the Premier League scene with Newcastle United in the last few weeks. Gareth Southgate has been impressed with Longstaff’s impact in the Magpies’ first team since he came off the bench to make his Premier League debut at Liverpool on Boxing Day. The England manager has instructed his scouting team to compile a detailed dossier on Longstaff’s performances, and a member of Southgate’s backroom team is known to have been present at Newcastle’s 1-1 draw at Wolves on Monday night. Despite only having made five Premier League starts, 21-year-old Longstaff has impressed sufficiently to leapfrog Mo Diame and Ki Sung-yueng in Rafael Benitez’s pecking order, and his performances have not gone unnoticed at international level. He is set to earn a maiden call-up to the England Under-21s for next month’s home double-header with Poland and Germany, and is regarded as a strong contender for a place in Aidy Boothroyd’s squad for this summer’s European Under-21 Championships in Italy. However, he is also on Southgate’s radar for senior recognition, with the England boss having displayed a willingness to fast-track players into the senior squad in the wake of last summer’s World Cup finals. Jadon Sancho made his senior debut in October’s Nations League game with Croatia, and Southgate also called up Mason Mount and James Maddison for England’s autumn matches. As the last few lines allude to, Southgate isn’t afraid to blood exciting young English talents into the senior set-up – and it sounds like Longstaff is on his radar after several standout performances since the turn of the year. He’ll need to take it a step at a time, both for club and country, but I see no reason why he couldn’t be a real part of Southgate’s plans if he keeps performing as he has been. What’s so crazy about all of this is the fact he may have still been waiting to make his Premier League debut at Newcastle if it wasn’t for Ki’s Asian Cup involvement and injuries to Diame and Shelvey! Who Could Replace Benitez if he leaves? I’ve said it before and I’ll say it again – if you don’t play the kids from time to time you’ll never know how good they are. Longstaffe would NEVER have been played if Diame, Ki and Shelvey weren’t all injured at once. He’d have gone on playing in the stiffs then loaned out and then probably sold to some Championship or League One team. There’s Toure, Sorenson, Sangare, Roberts, Bailey, the other Longstaffe and the Spanish winger who’s coming back from injury etc. who may all be similar sensations…. if given the chance for a regular run. Of course the problem is that if we had proper investment and the team was better and in totally safe positions in the league we could blood these youngsters more often (and perhaps save money. But of course we’re talking Ashley here who can’t see the bigger picture. ‘Successful’,’ intelligent’ business man? – my ar*e!